Diane Smith Whalen has experienced a call to priesthood since she was very young. She pursued a BA in religious studies, and served as a Jesuit Volunteer. She married, received her MSW, and did social work for a few years before becoming a mother to two beautiful daughters. In 1984, Diane began companioning individuals and groups in spiritual direction and retreat work. 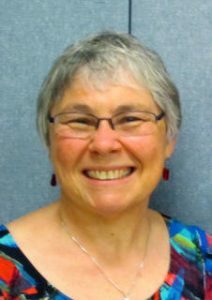 She helped develop and staff a program for the formation and ongoing supervision of spiritual directors as well as initiating a group spiritual direction program. Besides receiving an MA in ministry and a D Min. in spiritual direction, she was active in her local parish, serving as a lector, cantor, teacher/facilitator, and retreat leader. Diane was ordained to the diaconate in 2009, and to the priesthood in 2010. One of her greatest joys is serving Holy Wisdom as a priest. She also enjoys singing, cooking, taking walks, and spending time with her family and friends. Watch her TED Talk here. Kathleen Bellefeuille-Rice has felt called to the priesthood since she was seven years old. She received her early formation in radical Catholicism from her time at the Catholic Worker, from working in her large vegetable garden, and from raising her two children. Years of training as a catechist, specializing in Catechesis of the Good Shepherd, strengthened her love of scripture, liturgy, sacraments, and celebration. In 2013, she received her Masters in Religious Education from Graduate Theological Foundation. Kathleen was ordained a deacon on November 3, 2012, and a priest on May 31, 2014. She spends her free time doing foot care with homeless people, cooking dinners at a local soup kitchen, working in her vegetable garden, and backpacking with her husband Dave. For more information about Roman Catholic Women Priests worldwide, click here. For more information about Roman Catholic Women Priests in the Western Region, click here.